Home › Miscellaneous › Liebster Award, Thanks! Before we were WaterBloggers, we swam for Northwestern University. Katie is on the left while Maria and Vicky are on the far right. All three Waterbloggers were present at the 2000 Olympic Trials for swimming, though none of us knew each other, we lived in different states, and we swam different strokes. It wasn’t until we met in college at Northwestern University that we realized we could have been standing next to our future teammates back in 2000 and had no idea! We are dog people! Each of us has a dog that we love and totally spoil. Maria has a Yellow Lab named Darwin, Vicky has a Dalmatian named Kona, and Katie has an Australian Shepherd named Tiberius! None of us currently live in the state where we grew up, nor do all three of us live in the same state. Maria is currently in Texas (army), Vicky lives in Hawaii, and Katie lives in Maria’s former home, Alaska! Kinda makes staying in touch hard when you account for the time difference!!! We all started swimming at a very young age. Let’s just say… at birth. No matter how many hours we spent at the pool for practice growing up, we would all still jump at the chance to go to a water park or the beach! We loooooooove the water! All three of us are much taller than the average woman, who stands at 5’4”. Vicky is 5’10” while Maria and Katie are both 6’1”. We are all fans of surfing (see #5). We are very awkward on land. 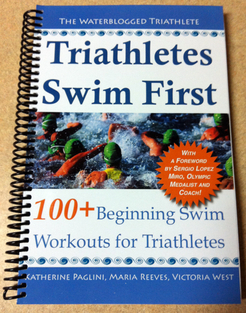 Most of our injuries happen out of the water when we try to do dry land things like running or walking up stairs. That being said, Maria loves playing Ultimate Frisbee and insists her last ankle sprain proves nothing! We love to cook… and eat 🙂 If you’ve seen our blog, you’ve probably noticed some delicious looking recipes up there along with all the swimming stuff. An athlete needs fuel! If there was an apocalypse and the world became overrun by giant marshmallows what would you do? Start a campfire and start making s’mores. Can the world be overrun by giant chocolate bars and graham crackers in this scenario too? What does your happy place look like? I’m talking that place in your head you go to when the kids/work/life in general is screeching. Beach + surfboard. What were you like in high school? (nerd, jock, quiet, clown etc) Nerdy jocks – we’re swimmers! Which celeb can you absolutely NOT HANDLE… as in makes you want to Gag every time you see them? Nope. Favorite Charity? Red Circle Foundation, Wounded Warriors, March of Dimes… we could go on for awhile. What does your ‘slouchy’ day look like? Such a winter question. We’ve mastered the wet ponytail/messy bun look. What food grosses you out the most? Can food be gross? Cats or Dogs? Dogs multiplied by three: Darwin, Kona & Tiberius!!! Where did you guys meet? We met on our college swim team, but we were recruited by many of the same schools, which means all three of us could have been teammates at a totally different school… or not at all! What’s the toughest sport you’ve ever tried? Swimming!!! 1. What’s the most important lesson a sport has ever taught you? 2. When did you find swimming? 3. If you had a kid, what lesson do you hope they learn from you and not the hard way? 5. Would people be surprised at your taste in music? 6. Who’s your “celebrity” crush? 7. If you could only eat one meal every day for the rest of your life, what would it be? 8. If you had your own reality tv show, what would it be… would you watch it? 9. If your last words had to fit into a tweet (140 characters or less) what would they be? 10. Who inspires you and who do you inspire??? 11. If you could only select one blog to follow, which one would it be? I would like to thank The Scarred Runner for awarding me with the Liebster Award. This award is given to new or up and coming bloggers who have fewer than 200 followers. Thank your Liebster Blog Award presenter on your blog and link back to them in your post. 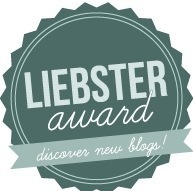 Present the Liebster Blog Award to 5 new bloggers (with fewer than 200 followers) to pass the award to and link them in your post. lol, I remember reading this when you originally posted it. No reason to accept a Liebster twice, just know we enjoy you!